One of the most rewarding experiences of founding and growing W3RKWELL this year has been the opportunity to create a health-centric company culture and ensure the wellness of our team from the beginning stages. After assembling our group we began doing health-related check-ins at the start of our meetings. It quickly became apparent that this team shared my big, hairy, audacious goals for improving health and business measures- both in the organizations we serve and in our own lives. Miguel was doing yoga almost daily while also meeting the demands of his PhD program and teaching/working full-time. Alex ran in the Rock 'n' Roll Marathon and made the leap into a new clinical adventure that more clearly matched her needs. Malerie re-evaluted her values and left an organization that was out of alignment with what she believed in and is now starting her own practice. Over the course of 5 months I've been inspired by my 3 co-owners and their efforts to remain healthy and prioritize themselves in order to produce, achieve and build W3RKWELL in addition to their own outside projects. I am so excited to begin this month-long journey with my team and with all of you. It is with great pride and excitement that I announce our Operation: Meditation at W3RKWELL. If you haven't checked out our Team W3RKWELL Takeover on our social media channels, check us out on Facebook, LinkedIn and Instagram and follow along. Our team will be posting and sharing our experiences as we take our very own course: Behavioral Xanax 2.0: Decreasing Stress-related Behaviors for Sustainable Health (if you haven't purchased the course yet, head on over to the Behavioral Observations podcast for our 30% off code). So without further delay, here we go! Though I've created three behavior-based meditation courses for W3RKWELL, I've never actually taken any. The idea to do it as a team came up while we were in a video meeting a few weeks ago. My team, always up for a personal development challenge, jumped on board and agreed to start the course with less than a week to promote, organize and generally wrap our heads around how to involve a wider audience. Kudos to them. I will be posting each day this week as I begin the course with the Week One video. I will be assessing/aligning my values, analyzing how I spend my time over the course of a few days, identifying my stress behaviors, and identifying/solving any barriers to my meditation practice before they become problematic. Today, before beginning any worksheets or videos, I set a goal to spend 5 minutes of my morning in a quiet space. I did not attempt to meditate or to do anything purposeful besides to have gratitude for the road ahead... and, of course, to breathe. Though it was tempting to dive into the meditation portion of the course, Week One is designed to prepare the learner by providing education and "anchors" to use during the process of behavior change (i.e., values assessment, identifying barriers). Today I decided to take advantage of a stressful week and began to notice my personal stress behaviors that work against my health. 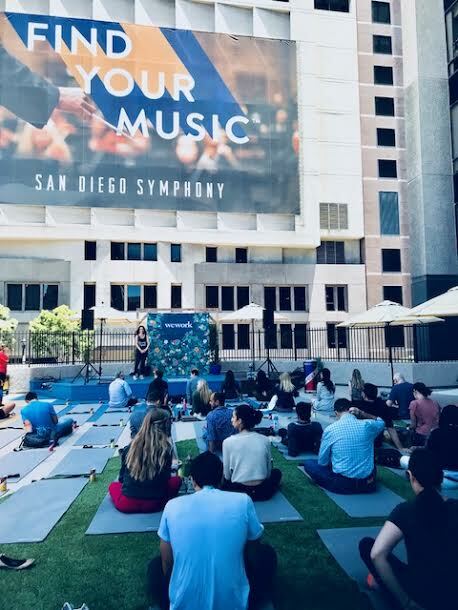 Given that this week is especially full with San Diego Startup Week in addition to executing clinical work, meetings, sessions and networking events, I was provided the opportunity to hone in on exactly what happens when I incur stress. It was surprisingly easy to decide on and track my three most prevalent behaviors: slowed or compromised ("shallow") breath, rounded posture (shoulders curved in and/or raised toward ears) and rapid responses in an irritated tone (yes, this course requires some honest self-awareness!). See below for some of my baseline data from the day, I'll be tracking this throughout the next month. Here goes nothing! I was lucky enough to stumble across an outdoor meditation class at my co-working space today. Watching first-time meditators reminded me of why our meditation courses came to be- to encourage others to create a few minutes for themselves in the day, to breathe, to refocus. Couldn't we all use more of that? As I track my stress behaviors- up from yesterday- I'm even more excited for Week Two. But first, finding my "why" with our values assessment. Check back tomorrow for the results! I meditate to set myself up for a productive, focused day . 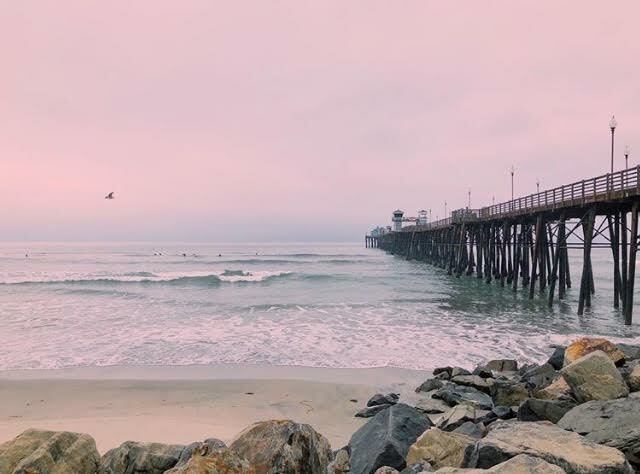 After a long Friday of catching up after San Diego Startup Week I'm back with my last three items on Behavioral Xanax 2.0- my perceived barriers, my time assessment and my meditation space. My #1 perceived barrier is what most of us likely face: time. However, this perceived barrier is something I solved right away through the course exercises. One of my favorite things about this course is that we ask students to identify barriers, tie their values into the "why" for completing the course and then specifically require students to evaluate how they spend their time. For those of us who enjoy a richly-packed life (I've stricken the word "busy" from my vocabulary), trying to find time for anything we aren't already doing sounds laborious. So I made the common mistake of telling myself I didn't have time, and that this would be my biggest barrier. "I don't even have time to (insert basic life activity here), who has the time to start meditating?!". WRONG. Just wrong. The answer? Data. We love data. Once I understood that I'm 1) solidly tied to my meditation practice through my values and 2) most likely to be successful in the morning, I was ready to create my meditation space. Remember, your space should be 1) easy to set up (if you don't already have a separate room or space dedicated), 2) aesthetically pleasing, a place you genuinely enjoy and 3) rewarding. 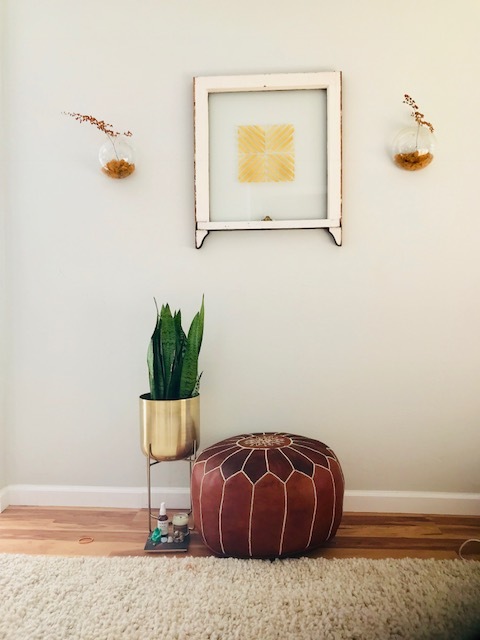 Last weekend I went shopping with my husband and we bought a new bedroom rug and a gold planter for our snake plant. I decided to make this my meditation space. Bonus: I can look out of my bedroom windows and see our eucalyptus trees swaying in the breeze, something that has always calmed me. I meditate to decrease my stress-related behaviors because I value tenacity, independence, excellence and setting myself up for a productive, focused day. Wish me luck! Next up for Week Two we have Malerie Gest, our resident Head of Hashtags. So, real talk: Behavioral Xanax 2.0 is my first real experience with meditation. Although I do practice yoga, I honestly tend to tune out during any meditation components of classes and focus on stretching or just doing my own thing. I totally echo the sentiments Gianna expressed in the Week One video on her initial thoughts about meditation: it always seemed intimidating and, honestly, a bit too whimsical or “hippie” for me. But becoming a part of the W3RKWELL team has challenged my perspective on a lot of things: the fact that mental and physical health are one, the role behavior science can play within our health, and how this whole “meditation and mindfulness” thing fits in with it all. 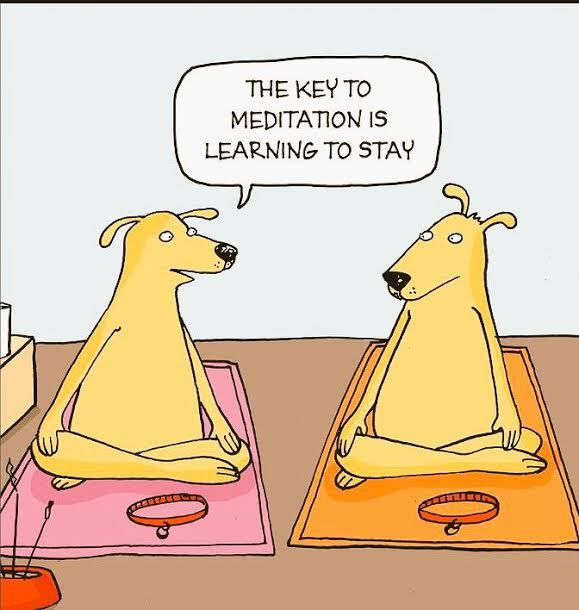 Oh, and that, on a scale of 1 to 10 with 10 being the biggest interview of your life, meditation ranks about as low as snuggling with a bunch of puppies. I am super excited for this opportunity to explore meditation in a formal way, alongside my awesome teammates and our equally awesome tribe of followers. Let’s do this, Week Two! I had to laugh a little at the irony. Probably not even ten minutes into the Week Two video, Gianna was discussing our constant desire for stimulation and I found myself wandering away from my laptop to “multi-task” with folding some laundry or starting on some dinner. Being present and content in the moment is definitely something that I have difficulty with, so I’m hoping that starting a meditation practice will help me stay on task for longer periods of time. Looking forward to continuing the Week Two video and learning the ins and outs of building a practice! Last week, my values assessment revealed these as my top 3 values: family, people-centered, and excellence. With these as my “anchors,” I strongly relate to the course’s discussion on meditation as contributing to something that is bigger than the self. Maybe it’s because I grew up in the collectivist culture of a traditional Filipino family or maybe it’s because my husband is really awesome and fun - but I’ve always cherished time with those I love and I deeply value opportunities to serve other people. I love the idea that meditation might help “fill my bucket,” so that I can fill the bucket of others. I’m committing to meditating (for the first time) for 1 minute tomorrow morning. Check back tomorrow for my results! Remember yesterday when I identified family as one of my top 3 values? And when I said my husband was really awesome and fun? Welp, today, his idea of “fun” was going to the gym together before starting the day. And I valued him so much as to go along with this idea. I may have found myself half-awake and curled up in a ball on a flat bench in the gym at 4:30 AM. I couldn’t make this stuff up if I tried. All this to say: I didn’t meet my 1 minute meditation goal this morning, but I was able to meditate a little later. I was relaxing on my paddleboard, hanging with some friends around the kelp beds about half a mile from the shores of La Jolla - and I was feeling a bit nauseous after that long paddle out. I decided to give meditation a try. I didn’t have my phone or a watch on, so I simply focused on my breathing, tapping alternating thumbs every third breath for probably about 3 minutes. Guess what? The nausea actually subsided a bit - I focused away from feeling sick and instead focused towards the amazing beauty around me. My first time meditating wasn’t perfect, but it worked for me - in that moment, in that space. The takeaway: just have fun and do what works for you! 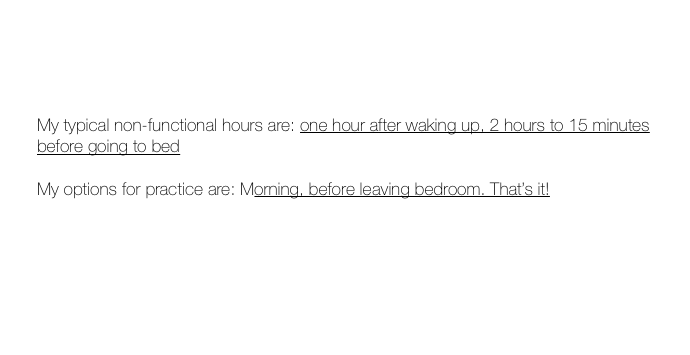 Thankfully, today started at a reasonable hour so I was actually able to meditate in the morning. I could surely get used to this morning routine! Being that yesterday was a holiday, my stress behaviors decreased and then actually increased above my initial baseline today. I’m thinking that increase may be related to my feelings of needing to play “catch up” after playing so hard on the 4th. Can anyone else relate to this? There are definitely some interesting behavioral contingencies at play here! This week has been full of many of my favorite things: the beach, quality time with friends and family and soaking up the sun - thanks to the middle-of-the-week 4th of July holiday! The downside to the unordinary (yet much appreciated) Wednesday off is that I felt a bit out of whack for the rest of the week. My weekdays are typically quite predictable and routine - and I like it that way. I had set a goal to meditate for 1 minute each morning before leaving the house. Clearly, I failed (see Day 3) even though my time allocation assessment revealed this to be the best time for meditating. Thankfully, I did catch up on days 4 and 5. While I do like predictability and routine during the week, the weekends are a different story. I tend to go into full "go with the flow" mode, which sometimes means sleeping in on Saturday morning and sometimes means getting up at the crack of dawn to start a day of unexpected adventures. You might guess where this is going: meeting my 1-minute goal was difficult over the weekend. And, because I value excellence, I became quite upset with myself. But then I realized that this was a moment where I had to focus back to my "why": I meditate because I value excellence, family, and serving others and so that I can perform well in all areas of my life. I love data just as much as the next behavior analyst, but this weekend has taught me that meditation is not just about meeting your numbers. It's about aligning your behavior and your time allocation with. your. values. For me, that means sticking to a meditation goal during the predictable week, but giving myself grace during the crazy weekends. So, my goal for the following weekends is to meditate for 2 minutes - at any point during the day. Today, I found the perfect time and space to meditate: sitting on a bench on the pier while hanging out with my husband. Wish me luck for the coming weekends! It is now my pleasure to hand things over to Alex, our lovely Chief Relationship Builder. Today begins week 3 of the Behavior Xanax 2.0. It’s been a fun and educational start for me thus far! Week 1 I discovered that my top 2 values are Balance and Excitement. I sort of had to roll my eyes at myself for this because I realized that from the get-go my core values show my daily battle; the constant desire to be go-go-go while also valuing the balance of accomplishing that, resting and having time for family. You could say, I live in a constant state of yin and yang, franticly juggling the two. With this knowledge at hand I realized it was these values that created stress-related behavior. My need to do everything and nothing caused feelings of anxiousness and notable stress-related behavior. Week 2 I (slowly) began my practice of meditation. Mind you, when I say I like to be doing things it’s to a fault. I get anxious when I’m idle, so the idea of sitting and "doing nothing" actually terrified me until a light bulb went off. I realized that in behavioral terms, sitting and just breathing is actually an action with a goal of decreasing stress-related behavior. I had forgotten to look at it in behavioral terms so the course was a nice refresher to get out of my head and back to the science. So, I started off with one minute as my baseline. Week 3: At the start of week 2 it was a lot of cuticle picking, peeking one eye open to check the timer, trying to count my breaths, losing count of my breaths and so on. However now on day one of week 3, I find myself being more conscious of my breath when I am doing other activities during the day and it makes me feel less scattered and more present. So have I reached Nirvana? No. But the understanding of my core values and how they are constantly in a clumsy tango has increased my awareness of my actions. In so doing it has increased my motivation to do the thing I often fear the most: nothing. Today was a busy day for me. Lots of planning, designing programs and shuffling schedules around. Currently I am working from home and at the computer most of the day, which is a special kind of prison for me. I know most people think working from home is a dream but as I said yesterday, I like to being on the go. I just find myself becoming very distracted when my body is still. Laundry? Sure! Cooking everything in the fridge? You betcha! Maybe I’ll take up basket weaving one of these days…! It takes a lot of effort for me to do one thing at a time. This is why doing Behavioral Xanax 2.0 couldn’t have come at a better time for me. Working from home requires me to be focused. The course has been helping me dust the cobwebs off of the skills I need to achieve that. People often say they “don’t have time” to be healthy, be active, send thank you cards. But see what happens if you change the phrase “I don’t have time” to “It’s not a priority right now”. It’s ok for other things in your life to change in priority all the time, but the reality is, there is 24 hours in the day. Taking 1 or 2 minutes to take a few deep breaths isn’t asking much. So reminding myself that I want to manage my stress, I told myself “it’s a priority and I will make time”. So, even though the entire minute was spent thinking of everything I have to do instead of just focusing on my breath, I did my best and that’s good enough for me. One of these days I will find the calm in my mind but for now I will strive for practice not mastery. Friday, Saturday, and Sunday have been interesting as far as behavioral observations for me. I have been actively tracking my stress related behavior throughout the course every day which (if I haven’t mentioned yet ) include: not cleaning up after myself, eating crunchy/ salty snacks, and short attention span. What I’m saying is that I de-evolve into the Tasmanian Devil. Friday, I observed these behaviors were slightly higher than Thursday but they went back down on Saturday. Environmentally speaking, I had significantly more task demands Friday than Thursday or over the weekend so this makes sense but none-the-less, as a scientist is brings me joy to see theory represented in data! The other interesting observation you ask? Well let me tell you….My stress related behaviors are lower than they were at the same time last week with similar task demands present! Now, they are marginally lower (decrease of about 1-2 instances of each behavior) BUT these data suggest that the intervention is working. Moving forward into the next week, I am looking forward to continue my practice of having a couple minutes to myself to slow down. Hopefully the Tasmanian Devil in me will continue to appear less and less. So, without further adieu, I will hand over our blog to our assessment guru, Miguel! Happy Monday to those following! Hoping that all is working out well for those in the BX2.0 course. I know that this group venture couldn’t have come at a better time. A few weeks ago concluded my first year in my doctoral program and I must say that this meditation and self-observation takeover has provided a much needed reset. I’ll add that I was a bit hesitant to add this to my agenda due to some other competing contingencies, but wow am I glad I did. My stress behaviors (nail biting & short breathing) were at a higher rate during week one, which coincidentally was the last week of the semester. Over the past few weeks I’ve been “feeling good” and have observed my stress behaviors decreasing. Looking forward to this coming week! One of the things that I really enjoyed about this course was the values assessment portion. Don’t get me wrong I love taking baseline and data, but I think the values assessment really provided that compass to where I was going. My two value-aligned goals for starting this course were: balance and learning. With balance being first. It’s easy to get into a groove where you make time for others and less for yourself & while not necessarily a bad thing, to me, balance is what is necessary for you to enjoy your surroundings. Whether that be friends, work, relationships, leisure, health, etc. This meditation practice has given me an extra boost of fuel to do a little more so that I can get back to contacting the things that motivate me most. One of them being running. I have the pleasure of living close to the beach and although the response effort to get there is low the response effort to make time is high. The past few days have been great as I’ve been slowly adding this back into my routine. It’s one of those things I can do endlessly. All I need is some scenery and a soundtrack to get me through. As I finished today’s meditation practice I realized that the more that I make time for this meditation practice, the more I seem to engage in what we can call healthy skepticism. As a scientist, it is expected that what is presented be taken with “a grain of salt” and further explored & researched. This got me thinking, what else is out there in the world of meditation?. In a massive online search, I came across a pretty good article by the Harvard Business Review. They included something that resonated greatly with me: “Mindfulness can help people create a one-second mental space between an event or stimulus and their response to it”. To clarify, as Gianna loosely said in her Behavioral Observations podcast, meditation is the behavior and mindfulness is the outcome that is shown to come with practice—so going forward I will refer to practicing meditation. The above sentence, roughly translated, says that engaging in meditation may work at providing a buffer between something in the environment and your rapid response to that event. Now, why is that? According to Daniel Goleman and Richard Davidson's research (outlined) in Behavioral Xanax 2.0), changes in the brain allow us to disrupt the immediate stimulus-response chain that occurs when you're, say, cut off in traffic (i.e., stopping to think "Oh man, did I cut that woman off?" as opposed to honking back and flipping the bird). Goleman and Richardson found that meditators were more likely to refrain from reacting immediately and put more time between an event and their response, thereby allowing the brain to slow down and enable the person to emit a more appropriate behavior. The past few days have been a whirlwind of madness from countless meetings to personal appointments, but luckily I’ve been able to set that time to practice my meditation. The challenge for sure has been in making time. Although I set a desired and workable time frame to practice, things come up. This led me to accepting that things are going to come up & that it’s okay. As long as I check in with myself and remember the values that I started with, things will go a certain direction if you continue to follow your plan. A major concern of mine from the beginning was the I might not have time to do this but the fact that I’ve started to feel some positive “side effects” has reinforced the practice of meditation. Going forward I’m hoping that the challenge to set time aside will be minimal. I’ve come up with a plan to stay at my 2 minute meditation and continue to increase the duration systematically (I mean as a behavior analyst there has to be a plan to maintain this socially significant behavior). It’s been a great time here taking part in this awesome W3RKWELL meditation challenge!